As I was growing up, my heroes were not only found inside the pages of a full-color magazines. 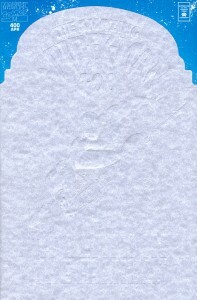 In addition to characters like Spider-Man, Captain America and the Fantastic Four, I also collected a different set of heroes who could be found on small pieces of cardboard. Those heroes went by the names of Daryl Strawberry, Dwight Gooden and Roger Clemens. When I look back all these years later, I see I did a better job picking comic book heroes, than I did sports heroes. But regardless of the legal and ethical problems encountered by the men I used to emulate on the baseball diamond, my fandom and adoration for baseball cards meant I was well-acquainted with the local sports memorabilia store. There was one store in particular, in Oceanside, NY, where my mother would take my brother and I on Saturdays and Sundays. Sometimes, I’d drop a few dollars on a pack of Topps or Donruss (those Upper Deck cards were way too expensive) while attempting to talk baseball with the two store owners. What was great about those guys was even though nobody in my family was a big-time spender, they still treated us like royalty. I guess they found us entertaining: the folks who’d come in a few times every month, spend an hour in the store and often leave without dropping more than $20. We never felt unwanted at this place, and I even remember walking into the store as a teenager a few nights after the New York Mets broadcast ran a comment submitted to the booth by a certain mginocchio@aol.com. One of the store owners had a beaming smile when he saw me and he complimented me for my “intelligent comment” (for the record, I think then-broadcaster Fran Healy did too after reading it on-the-air). While I always knew the owners recognized us as frequent visitors to their store, I never would have guessed they would be able to piece together an e-mail address mentioned on a broadcast and connect the dots to one of their customers who submitted it. That’s the attention to detail and personal-touch I miss these days as I do the bulk of my buying from a computer. In addition to cards and memorabilia, this store also had a decent-sized comic book section. It was mostly dedicated to new titles, but there were a few boxes of back issues as well, and all told, I’d say a good 30 or 40 issues of my Amazing Spider-Man collection were picked up at this baseball card shop. 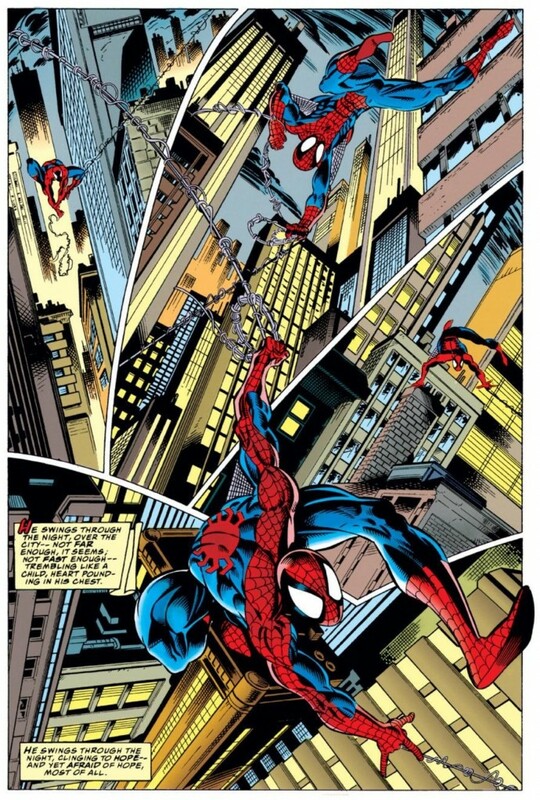 But none stand out to me more than my purchase of Amazing Spider-Man #400. By 1995, when ASM #400 was released, Jack’s the local corner candy store I used to shop at, had closed down (where it remained a vacant storefront for nearly a decade), so I had turned to this sports memorabilia shop as my primary provider of new comics. While the guys who ran the store were much more comfortable talking to their customers about baseball or basketball rather than comics, they also had no problem with the fact that I was now directing my limited finances towards Spider-Man rather than Darryl Strawberry cards. Still, they were initially startled when I told them I wanted to pre-order copies of ASM #400, a few months before it was set to be released so I could be guaranteed a copy. 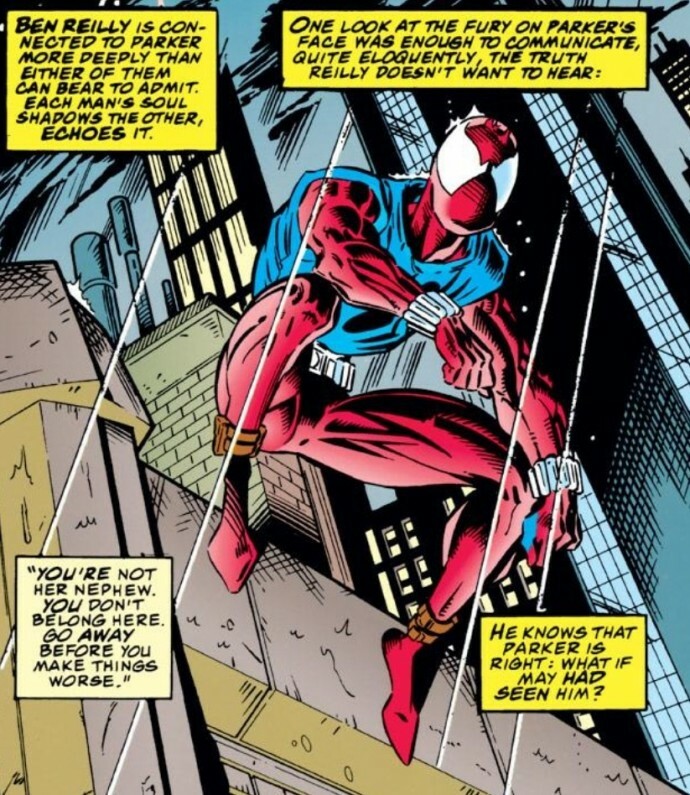 Given the hysteria surrounding ASM #300 in the years after it was released, I was absolutely convinced that ASM #400 would follow the same trajectory into the pop culture stratosphere. While ASM #300 nicely tied-in nearly 50 issues worth of storyline surrounding Spider-Man’s black alien suit, #400 was coming at a point where Peter Parker’s parents had been seemingly resurrected from the dead only to end up being fakes. 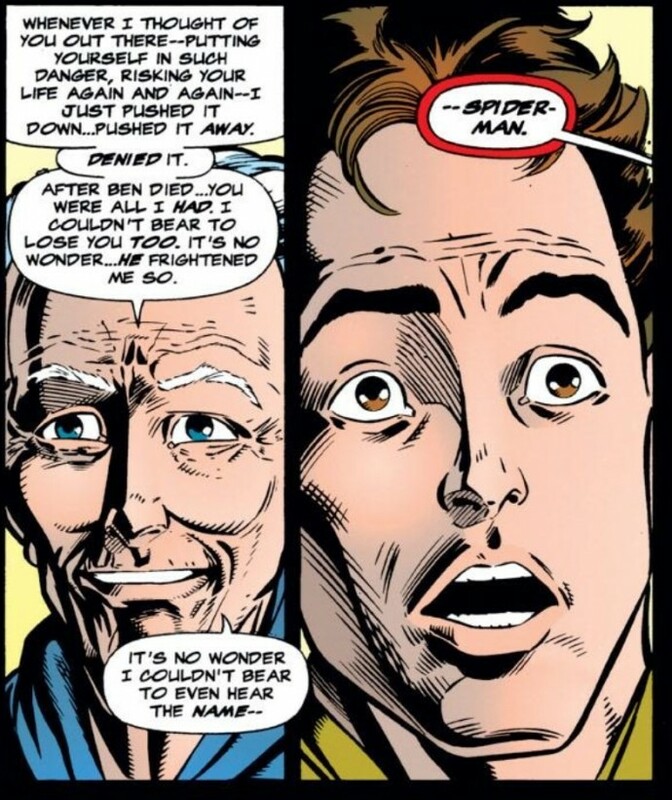 Meanwhile Peter’s clone, thought to be long dead and buried, started to turn up in the pages of ASM (and other Spider-Man comics) and there was doubt cast on who was the “real” Peter Parker. So I had good reason to believe that Marvel was preparing some kind of explosive revelation for #400 that would have long-term ramifications on the Spider-Man and Marvel universe, just as they did 100 issues earlier. 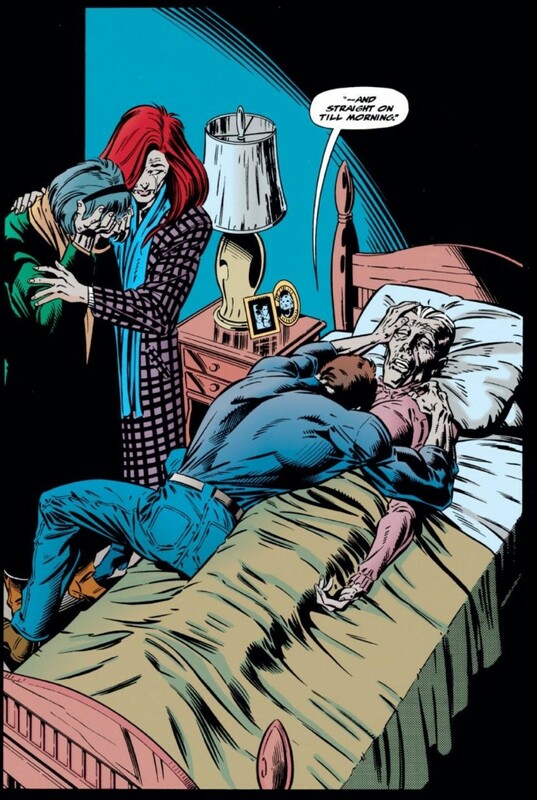 Not that Marvel didn’t try – after more than 30 years of heart attacks, and panic attacks and general frailty, ASM #400 did see the “death” of Peter’s Aunt May, who admits that she knew he was Spider-Man all along. However, this turn of events was hardly the cultural milestone that the first full appearance of the supervillain Venom turned out to be 100 issues earlier. 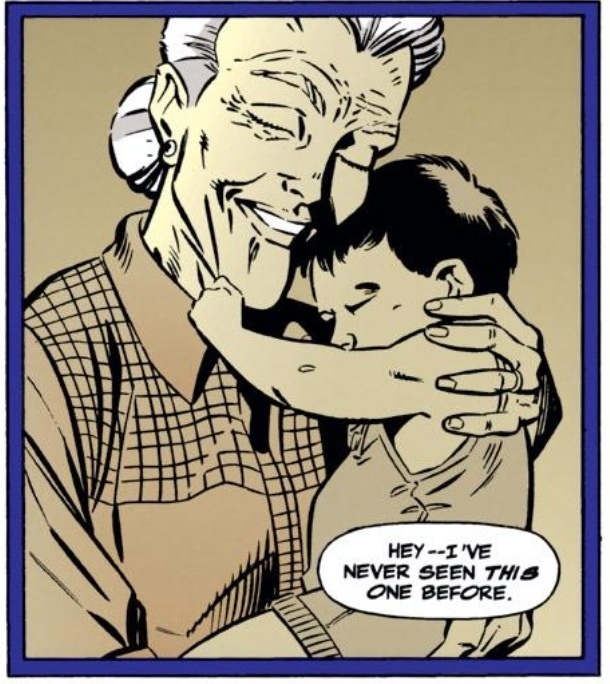 And then naturally, years later, Marvel “undid” Aunt May’s death, thereby fully destroying any remaining significance ASM #400 had. Still, without this 20-20 hindsight on my side, I was banking on the fact that lighting would strike twice, that ASM #400 would be huge (and be worth a lot of money) and I would be getting ahead of the trend by pre-ordering not one, but two issues from a place that was better known for selling baseball cards and autographed balls, instead of comics. While other collectors and fans were struggling to find their issues of ASM #400 due to the sheer demand, I would safely have my issues in hand. Simply put, this plan of mine was genius. And because this whole pre-ordering thing was so important to me, I was able to convince the proprietors of the baseball card shop that the release of ASM #400 was going to be a milestone event. As I walked into the shop each month to pick up issues #397, #398 and #399, whoever was working that day would smile and note how many issues away we were from the “big one.” While I’m probably giving myself too much credit, I like to think that I got these two sports fans excited about comics for the first time in their lives. At this point, I was so excited, I needed a brown lunch bag to breathe into. 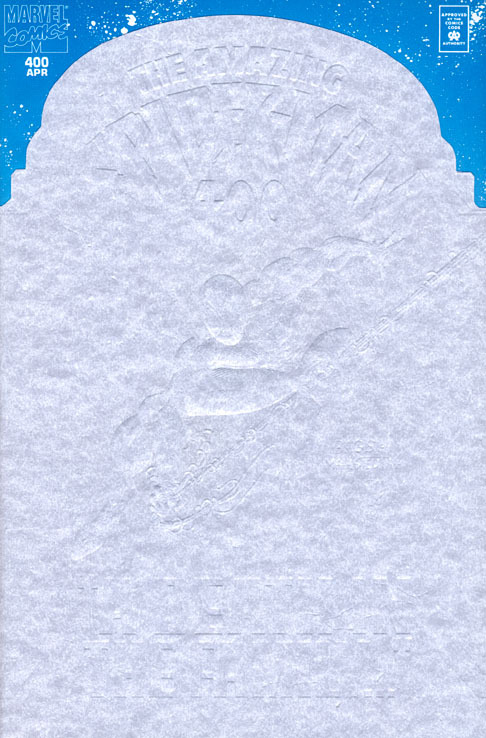 A tombstone? Who died? This issues was going to be even BIGGER than I predicted. I convinced my mom to give me a lift to the shop before it closed at 9 p.m. and both of those beautiful issues of ASM #400 were waiting for me. The second we got back home I raced through the issue. It’s funny, because just a handful of issues later, when ASM was in full clone mode, I finally shut down my collection for a number of years. So issue #400 was really my last blaze of excited glory for quite a while. 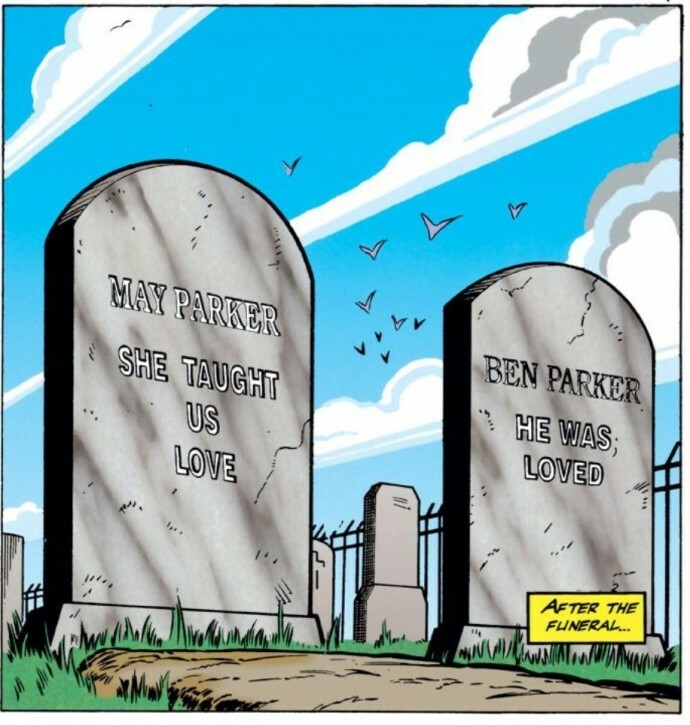 But I’ll never forget the emotional build-up for me prior to ASM #400’s release. And getting a personal call from the owner of my favorite baseball card shop still ranks up there as one of the coolest things that ever happened to me in the early part of teenage-years. That baseball card shop is still around to this day, in a different location. Anytime I’m on Long Island visiting my family, I tempted to swing by and see if either of those two guys is still there and if they remember pre-ordering me #400. If not, maybe they’ll remember my intellectual comment on the Mets broadcast.